The BD LSRFortessa is equipped with four lasers (405, 488, 561, 640 nm), tube acquisition as well as High-Throughput Sampler (HTS) options. BD HTS is a compact and high-speed sample loading device, providing automated acquisition of samples from a 96 well plate. 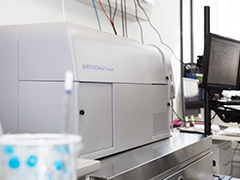 The BD FACSAria Fusion is equipped with four lasers (405, 488, 561, 640 nm) and a collection device which has bulk and single-cell sorting options. 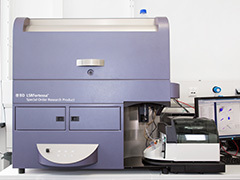 With this instrument, up to four populations can be sorted simultaneously. Possible collection devices are 1.5 ml sample tubes, 12x75 mm FACS tubes, 15ml conical tubes, and 96 well plates. The BD FACSMelody is equipped with three lasers (405, 488, 561 nm), integrated in a biosafety cabinet, ensuring operator safety as well as sample protection. 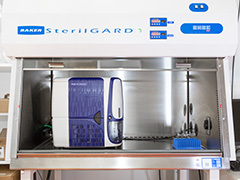 The collection device has bulk and single-cell sorting options. Possible collection devices are 1.5 ml sample tubes, 12x75 mm FACS tubes, and 96 well plates. With this instrument, two populations can be sorted simultaneously, and we are allowed to sort BLS2/GenTV2 materials.